When you know you want to have a pet, you start looking at all the available options and where you can get them from. Lots of people will scour animal shelters and rescues, eventually locking eyes with the creature they know will be their friend for years to come. While this normally means something with four legs and fur, dogs and cats aren’t the only animals you can keep as a pet. 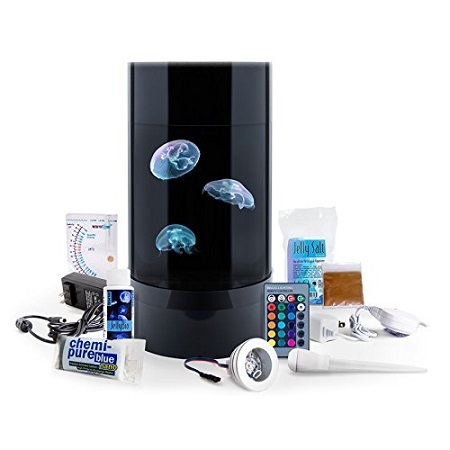 If jellyfish make you smile and you have the finances and attention to detail to care for them, then you might want to look into the Jelly Cylinder Nano. This is an aquarium that will keep your jellies safe, happy, and even provide a little extra mood lighting when you need it. This is a tank that is cylinder-shaped, uses a laminar water flow pattern that isn’t possible in normal fish tanks, providing a more natural habitat for your jellyfish. This uses an air pump that is whisper-quiet, and has an LED RGB remote so you can change hues to highlight your aquatic friends in any color of the rainbow. While this does make them very pretty, they are not low-maintenance pets, and will need to be kept up with. The jellyfish are not included in this $280 purchase, and you’ll need to make sure you get everything set up and as safe as possible so that your new-found friends can float happily along without the risk of death.